In recent decades food security has become a political concept because many of life’s most basic activities have been reduced to commodities and business ventures. Water is no longer a fundamental human right and neither is food it seems. The politics of food has helped create huge disparities between different social groups and their access to food. One of the most affected groups is small-holder farmers who are responsible for the most noble and precious activity: feeding the world. Dad Janki, Chief Administrative Head of the Brahma Kumaris was born in India around 1915. In India, two thirds of the population still live in rural areas, where agriculture and allied activities are the main source of livelihood. When Dadi Janki was around 50 years of age, chemical fertilisers and pesticides, and genetically modified and hybrid seeds became readily available on the market under a government initiative called the ‘Green Revolution’ which was aimed at a rapid and mass increase in crop production. Although crop productivity increased in the short term, the Green Revolution has since caused also a rapid increase in soil infertility as well as toxic residues in the production, storage and delivery of food. Today we have reached a point where agricultural productivity has stagnated and food security is seriously threatened. Access to healthy, safe and sufficient food is something enjoyed almost exclusively by the middle class. Through chemical (‘conventional’) agri-business, land is becoming increasingly infertile, demanding further use of fertilisers which is causing further soil exhaustion and loss of biodiversity. Genetic modification is the newest business created to artificially counteract the effects of climate change. Many farmers – perpetually disadvantaged and disheartened by agribusiness – are returning to traditional methods of farming. The Brahma Kumaris Rural Wing has taken great strides to address this crisis, which affects many of their stakeholders. The Rural Development Wing (RDW) of the Rajyoga Education and Research Foundation (RE&RF) is comprised of thousands of farmers and has a strong network spanning the entire Subcontinent. 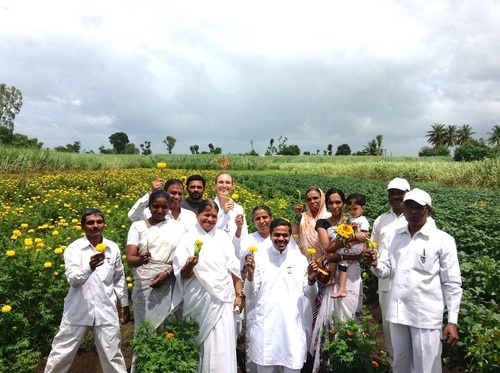 The RDW has worked with hundreds of farmers and research institutes across India to develop Sustainable Yogic Agriculture (SYA), a technique that incorporates the practice of Brahma Kumaris Raja Yoga Meditation with traditional methods of farming. This is the method of meditation practiced by Dadi Janki that has enabled her – despite decades of illness and weak physical health – to reach the age of 100 while travelling, teaching and sustaining a vast global community. The results of SYA research, determined by independent university studies, have shown significantly enhanced crop resilience and improved crop yield. We have learned the benefits of meditation from people like Dadi Janki. While Dadi Janki embodies the power attained through meditation, now hundreds of farmers are revealing the physical benefits of meditation through SYA. The practical outcomes of meditation has inspired two agricultural universities, a team of scientists, and has stimulated great international interest. ¿Cuáles son los pasos o procedimientos para sembrar de acuerdo a la agricultura yogiuica?